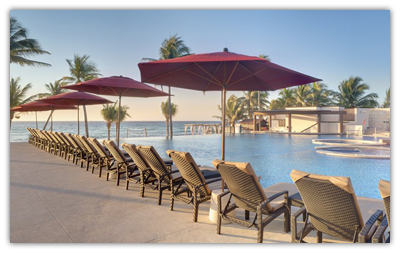 Families and friends gather to share an extraordinary beach and adventure experience while staying in the famously spacious suites of Azul Fives Hotel by Karisma in Riviera Maya, Mexico. 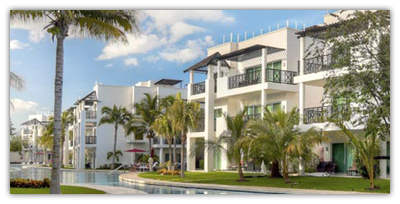 Whether one’s fondest wish is to swim with dolphins, walk along the pristine white sand beaches hand in hand, thrill to an exciting ride on a zip line, go scuba diving, snorkel among brilliant coral and colorful fish or relax and listen to the music of the mariachis, the amazing Azul Fives Hotel offers a world-class suite experience. Visitors find that this hotel offers a relaxing and luxurious oasis after fun and exciting days in nearby Playa Del Carmen that everyone has enjoyed. This incredible 360-suite family-friendly hotel offers exceptional accommodations including penthouse suites with rooftop lounges, which beckon visitors to completely relax and enjoy a stunning sunset while sipping a tropical drink. Private whirlpool tubs help to create peaceful bliss-filled memories along with a spectacular view. Suites range from one to three bedroom options, many with lounge areas, private barbecues, pergolas and high-end accoutrements like marble counter tops and modern kitchen appliances. Luxury and comfort are beautifully intertwined. Kids are made to feel welcome with imaginative accommodations including special Fisher Price suites. These fun suites cater to the little ones in exciting ways, with things like Little People robes, invitations to fun character breakfasts and age relevant toys by Fisher Price. 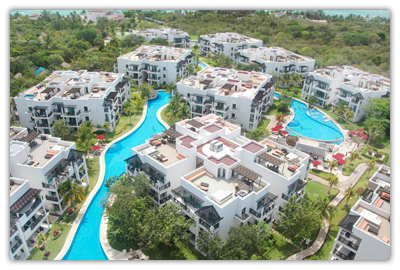 Special care is taken to make sure that all ages thoroughly enjoy their stay in interesting and scenic Riviera Maya. Guests can also revel in elegant spa experiences, featuring all the latest in pampering and pleasurable spa treatments. Kids are welcome to enjoy a special kids spa suite created just for ages 5 to 17, featuring a fun sparkle make over and a special Teen Girls Day Spa. Brides feel gorgeous and incredibly pampered on their special day as well with a relaxing Jacuzzi, massages, pedicures and manicures, makeup and hair styling. Brides will always look their most beautiful on their special day with the fabulous care they receive from this award-winning spa. A first class fitness room keeps visitors in the best shape with all the latest in advanced cross training and elliptical equipment and free-weights for the perfect workout. Visitors enjoy interesting and fun classes ranging from water aerobics to yoga. Golfers find world-class golf greens near Playa Del Carmen, offering a fantastic golf challenge and relaxation in the sun. Stunning natural attractions like the second largest barrier reef in the world, horseback riding on the beach, breathtaking and fascinating caves, private coves and over 80 miles of gorgeous sandy beach coastline regularly thrill visitors. Others find that they come for the exciting nightlife of Cancun and amazing shopping experiences in Playa Del Carmen, along with an award-winning, delectable choice of fine restaurants. Whatever visitors come to enjoy, they will find it all and bask in every memorable moment by staying at Azul Fives Hotel by Karisma, in exclusive Riviera Maya, Mexico. Baby amenities – stroller, pack and play, etc.